Heat oven to 350°F. Line a rimmed baking sheet with foil. Place 1 slice chicken on each of 4 sheets of plastic wrap. Cut extra chicken in pieces; place, overlapping, on slices so each is about equal size. Cover with plastic wrap; pound to fuse pieces to slices and until evenly thick. Uncover; sprinkle with 1/4 tsp salt and 1/2 tsp pepper. Top each with 3 slices cheese to 1/2 in. of edge. Place 1/4 the asparagus at narrower end. Tightly roll up; secure with a wooden pick. 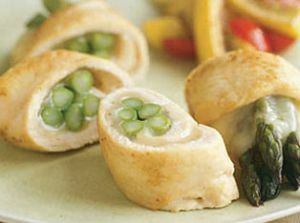 Roll roulades in 1 1/2 Tbsp flour. Heat 1 Tbsp oil in a large nonstick skillet. Add roulades; brown on all sides. Place on baking sheet. Bake 10 to 15 minutes until chicken is cooked through. Carefully remove picks and slice.